Source: Wikipedia, "Lords of Conquest," available under the CC-BY-SA License. 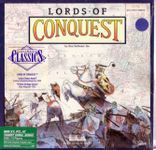 "Lords of Conquest is a 1986 strategy video game developed by Eon Software, Inc. (collectively, Bill Eberle, Jack Kittredge, Peter Olotka and Trevor Western) and produced by Don Daglow. The original version of the game was programmed for the Apple II in FORTH and assembly language by Ted Schmeckpeper, in collaboration with Eberle, Kittredge and Olotka. The game was published by Electronic Arts and released for the Commodore 64, Apple II, Atari 8-bit, Atari ST and PC DOS. The game is based on the board game Borderlands by Eon (best known for their highly acclaimed board game, Cosmic Encounter), and was marketed with the slogan "Better than Risk!" to identify it as a global conquest game similar to Risk. It proved to be one of EA's best-selling titles of 1986. GameSpy awarded Lords of Conquest a "Gotcha" award as one of the top games of its era."